(Robert Vendettoli/Boulder City Review) Boulder City High School sophomore Brooke Baker, seen putting the ball into play against Democracy Prep on March 25, 2019, hit a home run and had two RBIs in the Lady Eagles' 7-6 loss against Chaparral on Friday, March 29, 2019. Keeping pace with the Panthers 161-123, the girls won four individual events behind seniors Aimee Garcia and Rose Pouch and junior Quinci Thomas. Garcia placed first in the 100-yard breaststroke and 200-yard freestyle. Pouch placed first in the 500-yard freestyle. Thomas placed first in the 50-yard freestyle. Pouch also placed second in the 200-yard individual medley. Having a rough time with their 4A opponent, the boys fell 191-91, but picked up two individual events from senior A.J. Pouch. One of the best swimmers in the state regardless of classification, A.J. Pouch placed first in the 100-yard breaststroke and 200-yard freestyle. Sophomore Joseph Purdue finished second in the 100-yard butterfly and 500-yard freestyle. Boulder City High School’s softball team picked up its first league victory of the season Tuesday, April 2, with a crucial win over Sunrise Mountain. 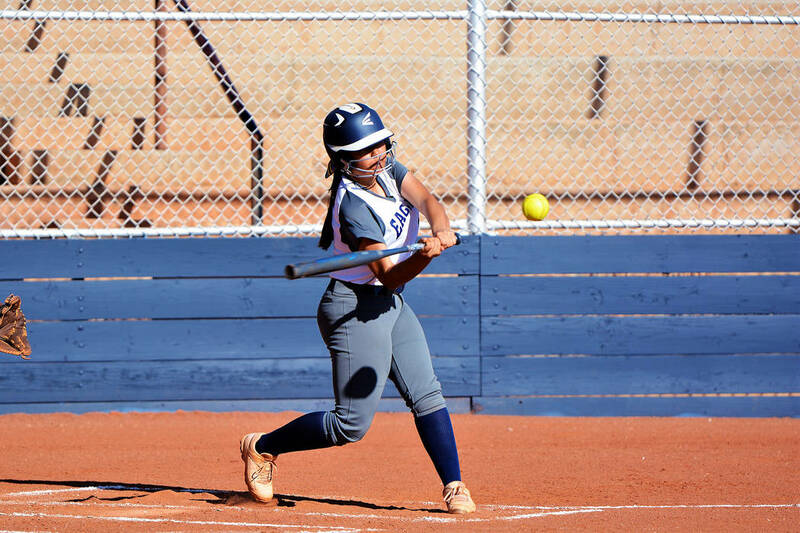 Dominating the Miners 10-4 after a slow start, the Lady Eagles rebounded from a league-opening 7-6 loss to Chaparral on Friday, March 29, helping dig themselves out of a potential hole. Trailing 2-1 heading into the bottom of the third inning, the Lady Eagles’ bats came alive, rattling off consecutive innings of two, four and three runs before quieting down in the sixth inning. Reese finished 4 for 5 at the plate with an run batted in; sophomores Rose Mackey (1 for 2) and Rachel Krumm (0 for 1) each drove in a pair of runs. Freshman Lily Hood batted 3 for 4 at the plate and senior Marleena Mills batted 2 for 4 with an RBI. On the mound, freshman Alyssa Bryant picked up the win, throwing four innings where she struck out six batters. The Lady Eagles dug themselves into a 4-1 deficit heading into the top of the fifth inning against the Cowboys before coming alive in the last half of the game. Doing her part at the plate, sophomore Brooke Baker batted 2 for 3 with a home run and two RBIs, while Mackey batted 1 for 3 with two RBIs. A case of would of, could of, should of to start league play, Moorhead is hopeful the loss will inspire the team to play at maximum effort moving forward. Winning its fourth consecutive league match, Boulder City High School’s boys golf team cruised past the competition at The Palms on Tuesday, April 2. Finishing with a team score of 322, the Eagles defeated Virgin Valley (392) and Somerset Academy Sky Pointe (411). Sophomore Blake Schaper led the way, finishing first with a score of 74 on the par 72 course. Taking the top three spots, senior Kevin Phelps finished second with a score of 78 and junior Jason Krumm finished third with a score 80. Sophomore Kyle Carducci finished fifth with a score of 90. Heading into the back half of league play, the Eagles host a week day event on April 11. Traveling to Moapa Valley on March 28, Boulder City High School’s girls track team finished second in the weekday event. Finishing with a team score of 43, the Lady Eagles were outshined by rival Moapa Valley (104). Del Sol (33) closed out the three team event. Junior Keely Alexander finished first in the long jump (14-5.25), while placing second in the 200-meter dash (29.82) and third in the 100-meter dash (15.07). Sophomore Chloe Payne finished first in the triple jump (30-6.76), and senior Erin Cowley placed second in the shot put (27-6). In distance running, sophomore Sophie Dickerman placed second in the 800-meter run (2:50.72), while freshman Mary Henderson placed second in the 1600-meter run (6:28.96). Senior Geri Wachtel placed second in the 300-meter hurdles (55.25) and third in the 100-meter hurdles (17.59). Placing third at the event, the boys finished with a team score of 39 behind Moapa Valley (90.5) and Del Sol (48.5). Sophomore Sonny Peck led the boys, finishing first in the triple jump (36-9), second in the both the 110-meter hurdles (19.57) and pole vault (10-0). Senior Justice Tilman finished first in the 300-meter hurdles (48.60) and senior Christian Long finished second in the 400-meter dash (59.87). In distance running, sophomore Sean White (5:06.67) and Tilman (5:13.88) finished second and third, respectively, in the 1600-meter run. Senior Noah Calvert finished third in the 3200-meter run (13:18.94). Hosting their second weekday event of the season today, Boulder City will compete against Chaparral, Pahrump Valley and Lake Mead Christian. They’ll travel to Valley on Wednesday to run against the Vikings and Democracy Prep.